BENTON HARBOR, Mich. — Anything Jack Nicklaus is sure to be good in golf, and The Golf Club at Harbor Shores is no exception. 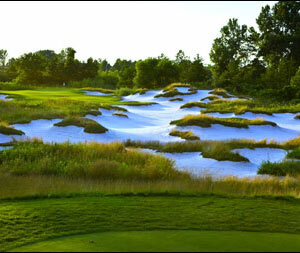 It’ll gain immense exposure in this summer of 2012 as the site of the Senior PGA Championship. It’ll also host that event in 2014. Considering the course didn’t open until July 1, 2010, it has elevated its profile by leaps and bounds in a very short time. The Nicklaus connection, of course, helped in the course getting instant credibility. It also didn’t hurt that Benton Harbor-based Whirlpool Corp. came on as a sponsor for the Senior PGA. Sponsors of that caliber aren’t as easy to find these days as they once were. Nicklaus’ design portfolio lists 275 courses world-wide. This Nicklaus creation, however, is something special. Nicklaus created it out of what had been a garbage dump. A factory was located where the first tee is now, and the land was covered with beer bottles and thousands of tires when Nicklaus first had a look at it. Before Nicklaus could go to work on the land 117 tons of trash, including 20,000 tons of contaminated soil, had to be removed. Mark Hesemann, Harbor Shores’ managing director, remembers the day Nicklaus arrived for the first time. “Where did you find this place?,’’ was his first comment. The city of Benton Harbor, located about 100 miles from Chicago’s city limits, has undergone difficult times in recent years. About one-fifth of its residents were unemployed when the creation of Harbor Shores began. Now the course is the centerpiece of a resort and golf community that has created jobs and housing, increased the tax base and brought tourists to the city. Many more will be coming when the Senior PGA Championship puts Harbor Shores in the world golf spotlight. So far, the course has had just one high-profile event. The grand opening celebration was indeed grand. Four of the biggest names in golf — Nicklaus, Tom Watson, Arnold Palmer and Johnny Miller — showed up for an event billed as the Champions for Change. “Just a joy,’’ was the way Hesemann described the event, which featured a clinic and evening gala that involved the four legendary stars before and after they competed for a $1 million purse in a skins’ game format with rotating two-man teams. About 4,000 spectators walked along during the competition, while about 2,000 watched the clinic and 1,500 attended the gala. Along the way the players combined to make 15 birdies and one eagle, but the highlight came when Nicklaus rolled in a 100-foot putt on the No. 10 green. That putting surface is highly uncharacteristic of Nicklaus designs — a three-tiered monster that has been controversial since the course opened. Measuring 10,500 square feet, it’s the biggest green that Nicklaus has ever created. Golfers who take on Harbor Shores will be intrigued by that putting surface and will certainly find some prettier sites as they tour the course. Nos. 7, 8 and 9 are on the shores of Lake Michigan and 10 others provide views of the Paw Paw River or Ox Creek and its wetlands. Longest of the layout’s three par-5s is the 573-yard fifth while the four par-3s range from 144 yards (No. 11) to 210 yards (No. 17). Joshua Andres, a local artist, has also provided a special touch for all the course’s visitors with his striking metal sculptures that designate each hole. The course has a slope of 143 and rating of 74.7 from the back tees.